Last Saturday was the home opener and season opener an the only game of the week. 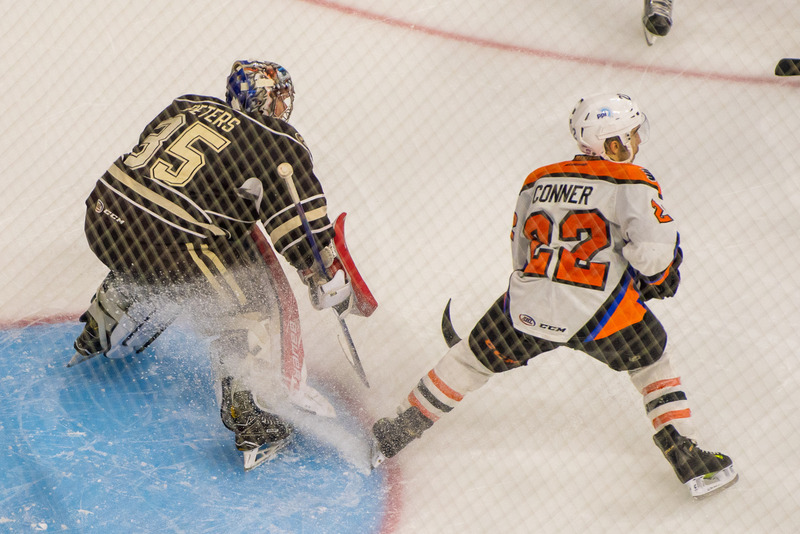 The Phantoms won 4-2 before a sellout crowd, and despite some sloppy play in the third period. Last night in Philadelphia the Flyers opened up the Wells Fargo for the season by raising a banner for the late Flyers leader, and then losing to the Anaheim Ducks 3-2. A notable change in the lines with the addition of Jordan Weal last weekend: We expected him to be centering the second line with Zengerle moving down to center the third. However, Jordan Weal ended up centering Danick Martel and Nic Aube-Kubel on the third line–what a group! The team is relatively healthy right now; D Mark Alt is still with Philadelphia until he’s healthy enough to be sent down. Brayden Schenn returned to the Flyers last night, but Michael Raffl was injured in Chicago Tuesday night, so that won’t dictate a move down. Gudas has two more games remaining on his suspension; we’ll have to wait and see if that prompts a roster move after 10/24. It’s not a certainty because the Flyers don’t have any extra blue-liners around with the injury to Del Zotto. Lamarche returned to the team to practice this week, but was sent down yesterday in advance of Reading’s trip to Wheeling, while Pettersson practiced in Reading the whole time. I would expect Bardreau to play tonight or tomorrow or both. Tuesday night, F Derek Mathers was loaned to an ECHL team in Texas. This move signifies to me that he wasn’t going to get playing time in either Reading or Allentown any time soon, so they got him to a spot where he can get on the ice. We wish Derek the best, and perhaps we’ll see him back here if the need arises. The Royals won their opener last weekend and won again last night in Wheeling. They’re now 2-0 overall. They’re back home in the Santander for Manchester tonight; It’s German Heritage Night with a beer fest and a stein giveaway and everything–even a Halloween jersey! Bridgeport Sound Tigers are the AHL affiliate of the New York Islanders. They’re 1-1 overall and come in at 14 in ChirpsFromCenterIce Power Ranking this week, compared with Lehigh Valley at 11. Former Phantom Ben Holmstrom is the captain of this squad. Defenseman Ryan Pulock, former first-round pick of the Islanders and owner of a laser slap-shot, has been recalled to the Islanders. Goalie Eamon McAdam, a Perkasie native and Penn State alum, has been sent down to ECHL Missouri and won’t appear tonight. Tickets and Parking: Plenty of seats remain for this game, as of this writing. For best locations, purchase in advance. No parking issues to report; remember Government Deck on 4th Street is now regular ticket parking rather than event parking. Broadcast Information: Service Electric TV-2; Radio 1470-AM; Arena Feed 89.9-FM; IHeartRadio or via PhantomsHockey.com online. Promotions: Ed Snider Tribute Night / Specialty Jersey; Coat Drive–bring new or gently used coats to be donated at the Tim Horton’s Gate from 5-7PM. Featured menu item is Cheesesteak Nachos at Donnybrooks behind section 111. Pre-Game: TV LIVE from Chickie’s and Pete’s at 6:30PM; Radio show pre-game at 6:20PM. I think I’ll be heading to Hamilton for some bourbon flights with Mrs. Kram tonight. Watch to see if we get an Alex Lyon game here–or maybe tomorrow. Watch to see who gets sweaters for that fourth line. If Bardreau is in, then guys like Straka, Knight, Goulbourne and Fazleev will split up with two playing and two sitting. Watch the special jerseys. The look cool, and should look even better out on the ice. 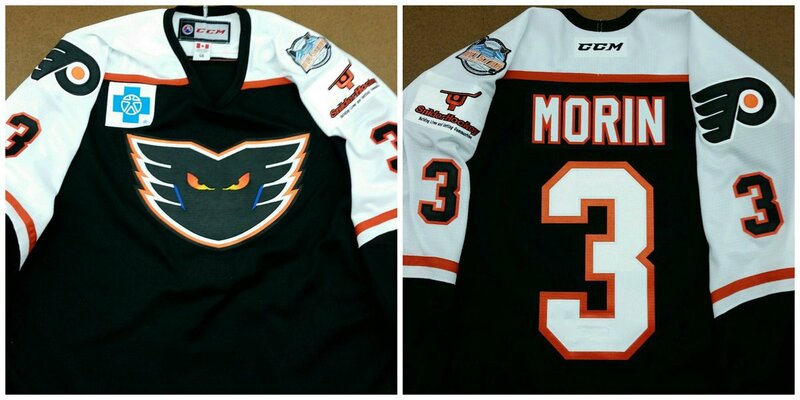 They’ve started silent-auctioning off the orange pre-season sweaters; stop by the table in the rotunda across from the team shop. Morin, Goulbourne and Mathers tonight. Reports suggest the Ed Snider throwbacks worn tonight will be auctioned via eBay starting Sunday, with proceeds to benefit his foundation for youth hockey. Watch that third line. They’re a lot of fun! We’re back at it tomorrow as the Wolfpack of Hartford comes to town. It’ll be another….HOCKEY NIGHT IN ALLENTOWN with a post-game autograph session. Ich finde es fabelhaft, dass Reading Royals deutsche Erbe feiern!